Guess what today is?! Well, it’s obviously Gluten Free Red Velvet Waffles Day (you know, that should really be enforced into calendars nationwide), but it’s also the day of my first ever virtual potluck. Yes, you read that correctly… Virtual. Potluck. I partnered up with Sarah from Fresh, Fit & Healthy and we’re both providing you with healthy patriotic recipes for July 4th this Friday! This is the dish I’m bringing to the “potluck” — Healthy Red Velvet Waffles made sugar free, low carb, high protein, and gluten free! These Red Velvet Waffles were inspired by a boxed red velvet pancake mix I saw at Target. My jaw literally dropped to the floor when I saw them. While I’ve heard of Red Velvet Cake, Red Velvet Ice Cream, and even Red Velvet Cookie Dough, I’ve never heard of Red Velvet Waffles. Too bad the storebought mix was full of unhealthy (and strange) ingredients, like highly processed white flour, bleached white sugar, and artificial red food dye… hmmm, no thanks. So I made a good and healthy all-natural version. These Red Velvet Waffles are sugar free, low carb, high protein, high fiber, and gluten free too. Instead of highly processed white flour, I used a mixture of coconut flour and brown rice protein powder. Instead of high-calorie, high-glycemic white sugar, I used Truvia (which is all-natural and non-GMO). 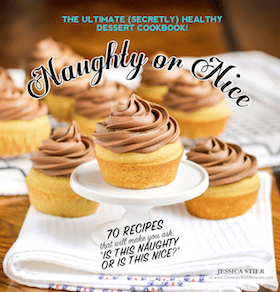 Instead of artificial red food dye, I used… a vegetable… I used beets. These waffles don’t taste like vegetables at all (trust me, I hate beets… beets taste like freshly cut grass to me). And these waffles? They’re legendary. They’re soft and sweet and cakey and decadent… especially with the super thick and creamy cream cheese frosting! If you’re craving some Red Velvet Cake but it’s only 8am (apparently that’s a socially inappropriate time to be eating cake? 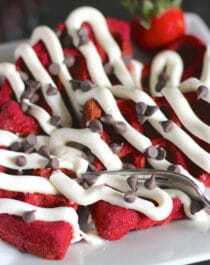 ), then make these Gluten Free Red Velvet Waffles! They’re sugar free, low carb, high fiber, high protein, and gluten free, but you’d never know it! 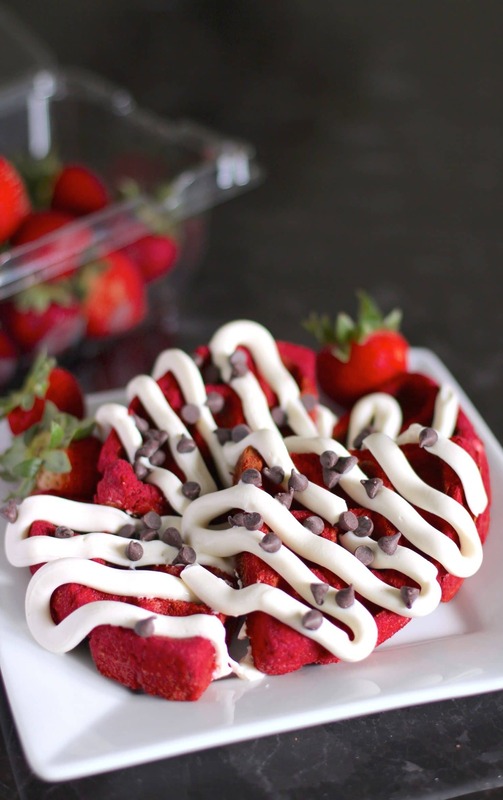 Healthy Red Velvet Waffles made sugar free, low carb, high protein, and gluten free! Rinse and gently scrub 2 medium beets, then individually wrap them in foil. Place the beets on a jelly roll pan and bake for 1 hour, or until a fork pierces through the center of the beets with ease. Carefully unwrap the beets and let cool for 30 minutes. In a medium-sized bowl, whisk together the beet puree, eggs, Truvia, vanilla extract and butter flavor. 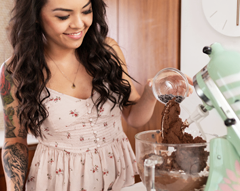 Whisk in the coconut flour, then the brown rice protein powder, then the baking powder. Last, whisk in the vinegar. Heat your rotating waffle iron to medium heat and spray with cooking spray. When the iron is hot, scoop half of the batter onto the iron and spread out slightly. Cook for 1 minute, rotate the iron, then cook for 1 minute on the opposite side. Rotate the iron back upright and carefully remove the waffle (the waffles are slightly delicate, so it's easiest to take out ¼ of the waffle at a time using a large fork on either side to bring it out). Spray the waffle iron with cooking spray and cook the next waffle. In a small bowl, whisk together the Neufchâtel, yogurt and Truvia. Scoop into a piping bag and drizzle over the waffles. Serve with mini dark chocolate chips, strawberries, raspberries, or forks alone. Enjoy! Don't heat your waffle iron to a high heat otherwise the waffles will turn brown. These waffles are soft like pancakes, not crispy! As a comparison, here is the nutrition label for Duncan Hines Red Velvet Waffles recipe. Not trying to brag or anything but uh, my recipe’s nutrition label is pretty sweet. 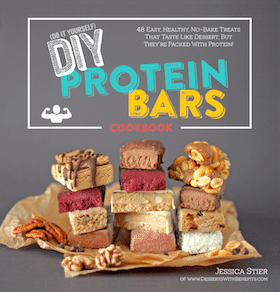 They’re nutritionally balanced with healthy fats, filling fiber and complete proteins. Plus, they’re lower calorie and lower fat than the Duncan Hines recipe. 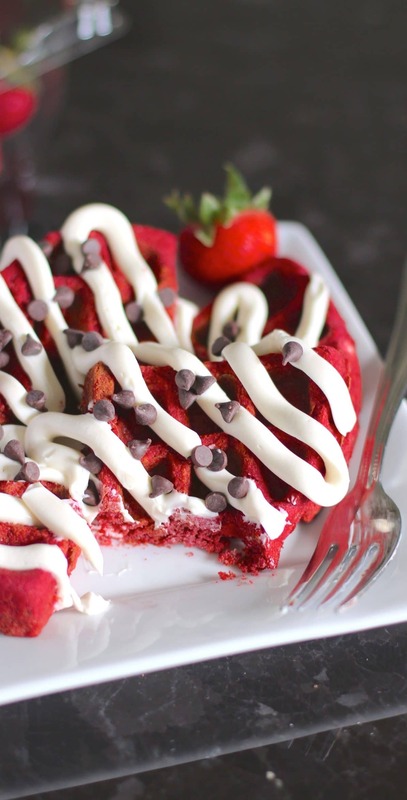 These Red Velvet Waffles are totally breakfast-worthy. 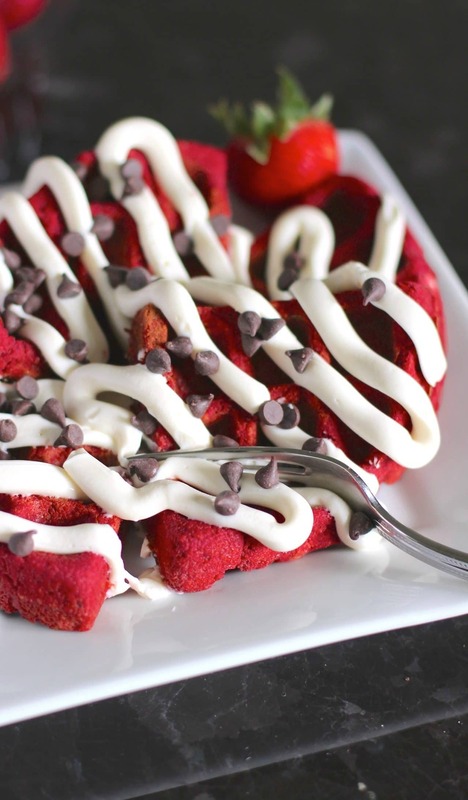 All hail these (secretly) Healthy Red Velvet Waffles and Patriotic Margaritas!! If you’re making these waffles for July 4th, top them with fresh blueberries to make a red, white and blue dessert! Oh my goodness, we’re totally in the same boat there!! I mean, it’s got a veggie (beets), protein (eggs + protein powder + yogurt) and healthy fats/carbs (coconut flour). No way does that icing look like toothpaste! I would DIVE right into those if I could! So happy to have done this with you girly! Looks DELICIOUS. I am drooling so much, I am dehydrated!!! I hope you get to make the waffles soon! I’m planning to make these on Tuesday for my friend who can’t have flour or sugar. Coconut flour is fine, I think (I’ll double check), so these sound perfect! I don’t have Butter Flavor/Emulsion though and not really sure if I can find out where to get it in time. Can I just use real melted butter instead? The butter flavor is just there for that yummy butter flavor 😉 you can use real melted butter instead, as well as to grease the waffle iron. hey!! These look awesome and i cant wait to try them, but i just have one question. Is there anything i can replace the beet with like maybe red food coloring with water? Cuz beets have too many carbs for the plan im on and if i could find a sub that would be perfect. Thanks!! Just wondering what is red velvet suppose to taste like? Im just wondering if I can substitute the cocanut flour and brown rice powder for another type of flour like oat or rice flour? Also what about adding some fresh or frozen berries rather then the sugar? I tried medium heat but my waffles still turned out brown 🙁 Perhaps I should do low heat to preserve the color? That red you have.. Looks EXACTLY like as if you used red food dye, hehe. Awesome job!! Hmmm that’s really strange. I’ve never had my waffles turn out brown, and I 100% refuse to ever use artificial food dye. I guess our waffle makers have really different heat settings! I have tried putting it on low setting and it turns brown after more than 8 minutes 🙁 I left it that long because it needed to solidfy! When I opened my waffle maker after 5 minutes, it was still pink-ish but broke into 2x because it was not fully cooked yet 🙁 Thank you for your reply! !